Methods: A literature review identified 4 limited studies that used primarily the Global Trigger Tool to flag specific evidence in medical records, such as medication stop orders or abnormal laboratory results, which point to an adverse event that may have harmed a patient. Ultimately, a physician must concur on the findings of an adverse event and then classify the severity of patient harm. Results: Using a weighted average of the 4 studies, a lower limit of 210,000 deaths per year was associated with preventable harm in hospitals. Given limitations in the search capability of the Global Trigger Tool and the incompleteness of medical records on which the Tool depends, the true number of premature deaths associated with preventable harm to patients was estimated at more than 400,000 per year. 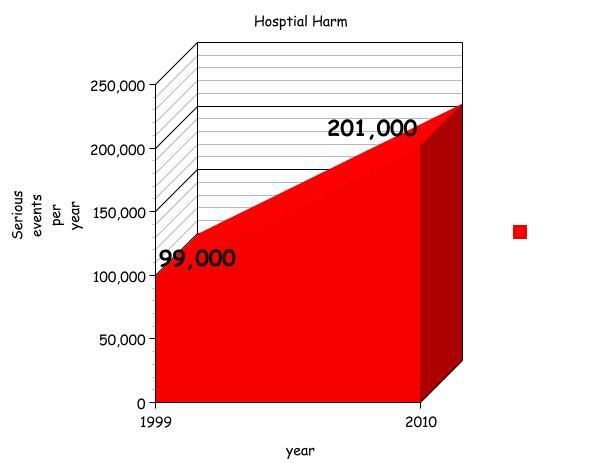 Serious harm seems to be 10- to 20-fold more common than lethal harm. Conclusions: The epidemic of patient harm in hospitals must be taken more seriously if it is to be curtailed. Fully engaging patients and their advocates during hospital care, systematically seeking the patients’ voice in identifying harms, transparent accountability for harm, and intentional correction of root causes of harm will be necessary to accomplish this goal.